Calling all Free-flyers. From Solo's to 69 ways, come along to our all weekender! Free accommodation for all jumpers and free-flying coaching available for all those looking to progress. Lets link up! This event will be held on a monthly basis so book early to avoid disappointment. To book a place please email tps@skydivingassoc.com.au or give us a call on 03 9432 2419. Like our page on Facebook for further details via Skydive Euroa - The Parachute School. Ok you know the drill... lets get everyone together as quick as we can! For those of you who havent done a speed star yet this is great fun and a fantastic way for everybody to get some skydiving experience in. We will be hosting a monthly speed stars event for all those interested. Please register for interest for our super duper speedstar weekend: tps@skydivingassoc.com.au or call Ian on 03 9432 2419. Like our page on Facebook for further details via Skydive Euroa - The Parachute School. We loved it so much we're putting it on again! Therefore we are immensely excited to announce our second helicopter event of 2013! We will be hosting an insane weekend of helicopter skyfalling and shenanigans, delivering a much needed relief with a massive dose of altitude awesomeness..
From the crew that brought you "i know... lets push a 4 person raft out from 13 grand" and a fearless dropzone with a penchant for doing things differently. When other dropzones told you no, Skydive Euroa heard your screams for more. Sooooo listen up! We will be commendeering a Hughes 300 Helicopter for two days of nonstop 4000ft hop and pops. YEAH BOY! We jumped out of the plane amongst a Billion stars. I was in awe and completely lost in the moment. I may have even forgot who I was for that split second... We could see the Milky Way, Orion's Belt and The Southern Cross. Having never seen a shooting star before, I witnessed 8 of them shoot across the sky. What an incredible experience. It is for this reason, and this reason only that we would like to extend the invitation to you. If you jumped by day and loved it, skydiving at night takes the experience to a whole new level. Tandem Night Jumps are available on a monthly basis. Please Like our page on Facebook for further details via Skydive Euroa - The Parachute School. Check our calender for ultimate Sky Diving Experience in the next event! Skydiving Melbourne? 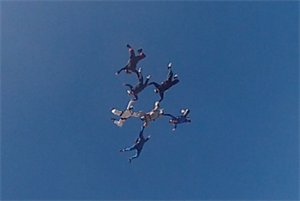 Skydive Euroa. 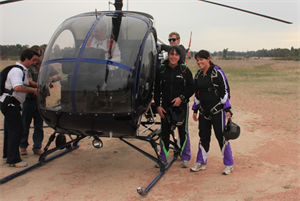 At Skydive Euroa we have a pretty cool bunch of adventure fanatics! We do skiing, we do snowboarding, we do skydiving! Every year we combine the three together and fly away for an epic trip of madness. 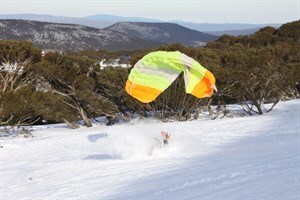 Jump into the snow with Skydive Euroa - The Parachute School! Come along to our dropzone and we will fly you away for the experience of a lifetime. Whether you want to make a week of it or simply want to spice up your weekend we can cater for all wants, needs and desires. Skydive into the snow and try your hand at skiing. Later, we warm our mitts up in front of the log fire in the log cabin and enjoy a hearty filling meal. Hot toddy anyone? Please email your interest to tps@skydivingassoc.com.au or call Ian on 03 9432 2419. Availability subject to bookings. 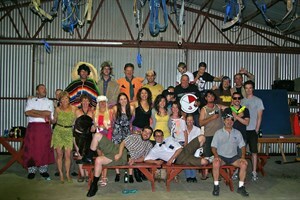 Skydive Euroa's 30th Birthday Bash! 2013 marks our 30th Anniversary... Can you believe we've been in business a whopping 30 YEARS?! Time flies when you're having fun! Its time to celebrate and oh boy we are gonna celebrate in S.T.Y.L.E! Check out our 4 day line-up. Beauty Pageant – Who’s the best looking skydiver??! Its going to be mental, unmissable. unfathomably immense! So come along, bring all of your friends and lets have some serious fun. We have a lot to celebrate. The birthday bash is going to be held 1-5th November 2013 So whether you would like to come along for one day or all four please register your interest to tps@skydivingassoc.com.au or give Ian a call on 03 9432 2419. Its Christmasssss! 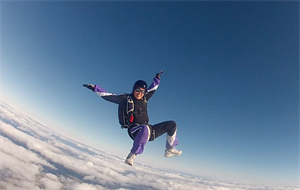 So all the people we spent the year with come up and celebrate with us skydiving in style! And you can be rest assured that the end of the year activities are going to go off with a blast. Fred Flintstone, Tarzan Jane and the drop zone pirate are just some of the characters thatcame along to last years event. BBQs, Bonfires and drinks, fun and laughter. Its the spice of life. This year we will be planning one bigger and better. Further details coming soon... Like our page on Facebook for further details via Skydive Euroa - The Parachute School. Our fly away trips are epic! With our own planes and pilots in tow we can take you on the adventure of a lifetime! 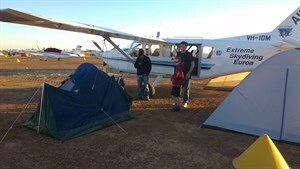 Sleep under the wing of the plane and see some amazing sights, drink, eat and skydive! We are currently taking interest for our next fly away trip at the end of August, so get voting on the following destinations!